Natural grass lawns adorn front yards and backyards across the nation, but the cost, maintenance and water requirements for these high-maintenance landscaping features have many homeowners on the hunt for lawn alternatives that are better for the planet and their bank account. For some, saving money is a key concern, and grass alternatives that require little or no water, pesticides, fertilizers, herbicides or gas-powered equipment is an appealing way to enjoy significant savings while still having a beautiful yard. For others, mowing, watering, feeding, weeding, edging and aerating a natural lawn is just too time consuming, and the cost of hiring landscape professionals to care for their lawn is just as undesirable. Other homeowners look into grass alternatives as part of their efforts to lower their home’s impact on the environment, since conventional lawns require more than their fair share of water, and common lawn care products – like chemical-laden herbicides and pesticides – are harmful to the environment and are linked to a variety of health issues. You can save money and time, limit your family’s exposure to harmful chemicals, decrease your environmental impact and still have a great-looking yard by replacing your lawn or decreasing your lawn space by choosing one of the alternatives listed below. If you are looking into installing landscaping that does not include natural grass, replacing your current lawn or reducing the size of your lawn, there are a few things to consider to help ensure that you are making the right choice. 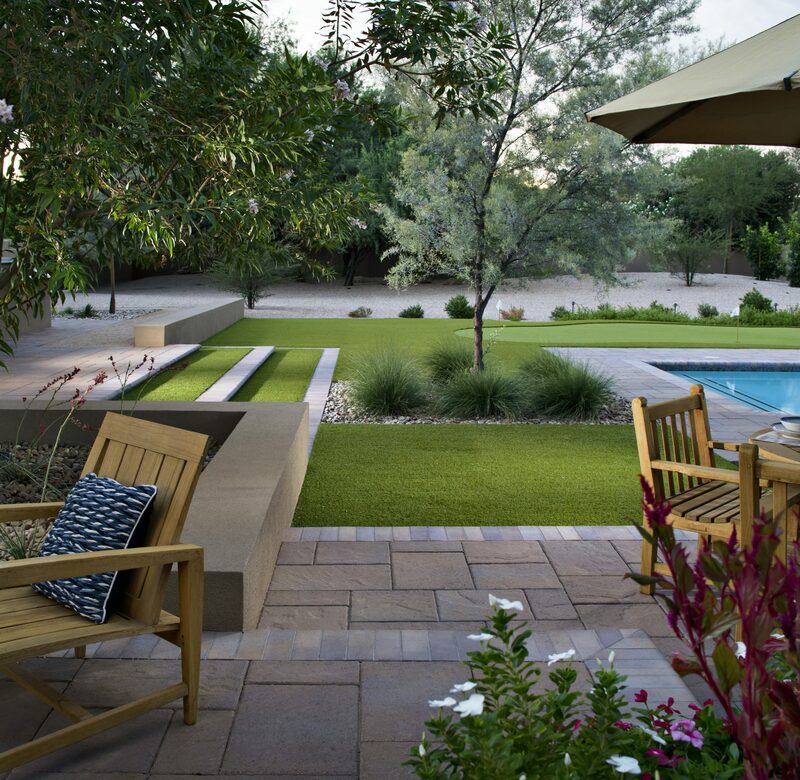 One of the most important considerations is determining how you want to use your yard. Is your front yard just for looks, or do you want it to serve an additional purpose? 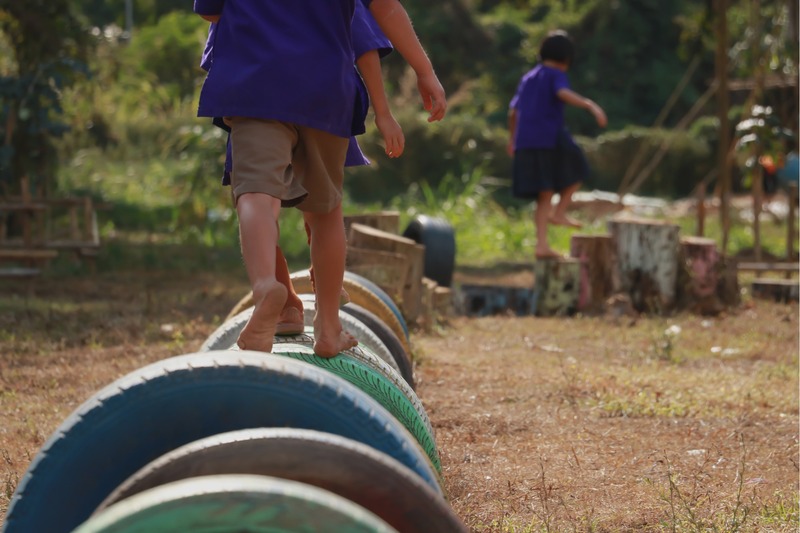 Do you want your backyard to be a place where your children or pets can play? Do you plan on entertaining guests often? 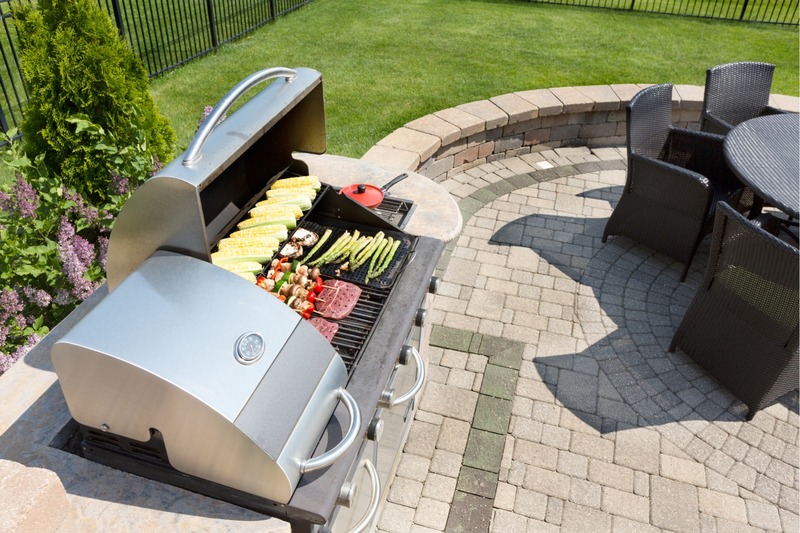 Do you enjoy grilling and cooking outdoors enough to invest in an outdoor kitchen? Are there particular features you would like to include, such as a vegetable garden, children’s playground, dog run or putting green? How you want to use your yard will have a significant influence on planning your low-maintenance landscaping, so be sure to consider your needs before you begin the design process. Once you have decided how you want to use your yard and what features you would like to include, the next step is considering your budget. For example, an outdoor kitchen would be an excellent addition to any backyard, but they can become quite pricey quite quickly, particularly when you add in running electricity and a water line to your patio. But if your budget does not allow for a full backyard kitchen, you still might be able to install a built-in barbecue and design a wallet-friendly alternative. 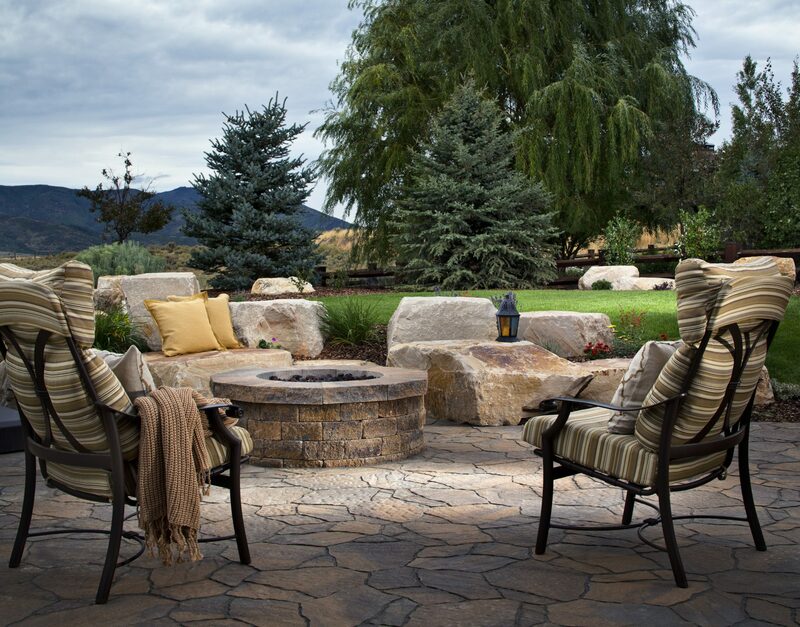 Or, if an in-ground rock fire pit is above your budget, you could still create a cozy place to stargaze or entertain with an affordable, portable fire pit and inexpensive patio furniture. The next thing on your to-do list for planning your yard is to decide just how low maintenance you want it to be. Do you want a yard that requires the least amount of maintenance possible? This might mean designing a yard that is mostly made up of hardscape features and low-maintenance ground covers, such as a large patio and walkways with gravel or bark as a ground cover. This type of design would require very little maintenance with just an occasional sweeping or rinsing off for the patio, and a bit of raking and freshening up on occasion to keep the gravel or bark looking sharp. Or would you prefer a bit of greenery that requires just a little maintenance? This option might include drought-resistant plants, artificial turf, or easy-to-care-for trees or shrubs. If you know that one of your goals is to avoid having a natural grass lawn or to have just a small lawn, the grass alternatives below will help you design a yard that is inviting and fits your needs. I have also included some pros and cons for each idea in order to help you choose the right lawn alternative for your home and family. Be sure to check local ordinances — or your CC&Rs, if you live in a community with a homeowners association — before removing your lawn and replacing it with alternatives to grass. Some neighborhoods and areas have specific requirements or regulations governing how you can landscape your property. If you are tired of weekly mowing and rising water bills, try replacing your lawn with a wildflower meadow. Seed mixes are easy to come by at your local garden center, and you can have a beautiful, flowering meadow to enjoy instead of a typical grass lawn. A vegetable garden is a great addition to any backyard and can be an attractive landscaping feature when done right. Install raised planting beds for a tidy, uniform look, and you will have a great family project that lets you grow some of the food you eat. An herb garden is an attractive lawn alternative that adds color and texture to your landscaping. Herbs can be planted in borders, raised garden beds or in the ground with meandering pathways that lead through your garden. Aside from colorful blooms and easy care, an herb garden also allows you to grow useful plants that can be used for culinary or medicinal purposes or that can be used in cut flower arrangements. If you have a shady yard, or a shady area in your yard, moss can be a great, low-maintenance alternative to grass. 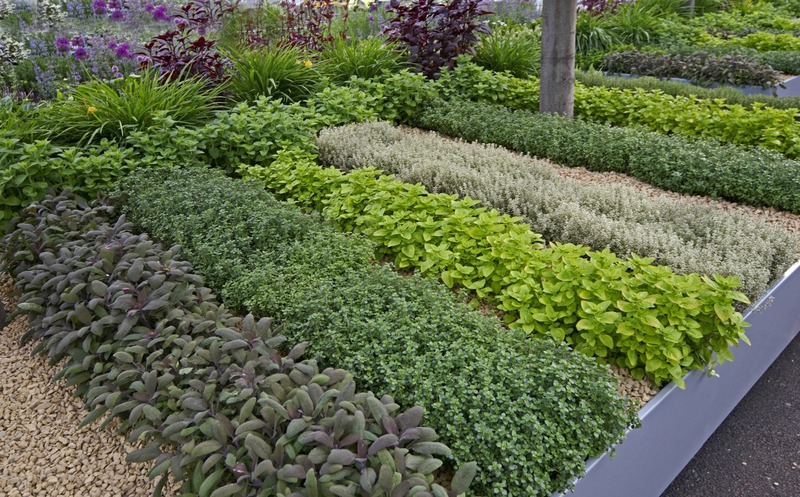 This low-growing ground cover comes in many varieties, which allows you to choose between a smoother texture or options that look more like grass. 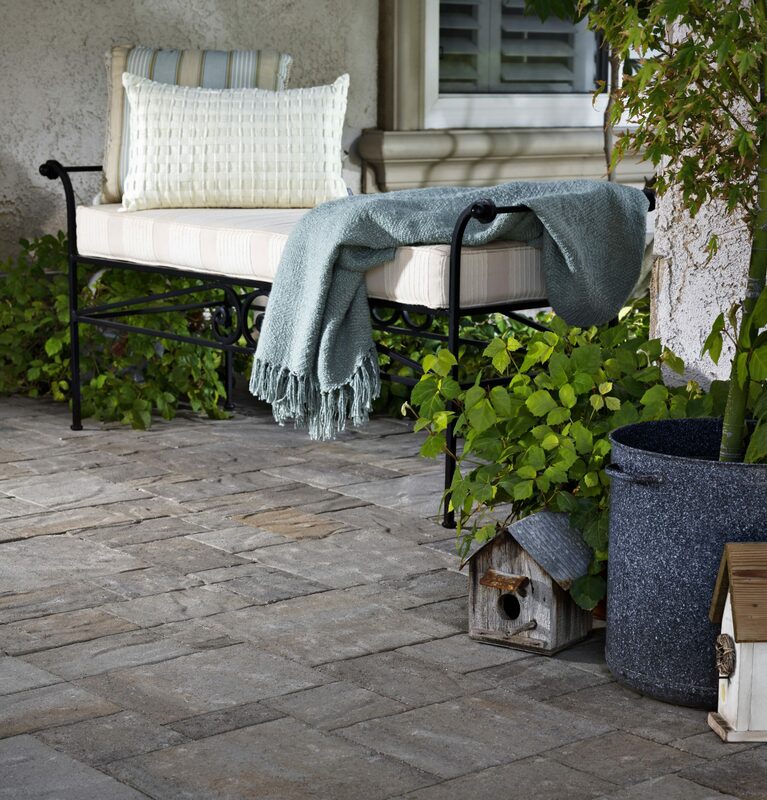 Gravel is an economical, simple alternative that can be used anywhere you need a ground cover. Your local garden center or rock yard will have a variety to choose from, giving you some choice in the size and color of gravel you use in your yard. Using wood chips or bark is a great way to cover ground with a low-maintenance material that is attractive and easy to care for. This affordable option is available at garden and home centers, and can easily be used as a lawn alternative. You may also be able to find free or low-cost wood chips in your area by contacting local tree trimming and removal services or through local programs. For example, San Diego residents can purchase natural wood chips for $24 per cubic yard at Miramar Greenery. Mulch is a low-cost, low-maintenance, attractive alternative to grass that adds color to your yard, limits weed growth and helps to control erosion. You may be able to find free or low-cost mulch through local programs or from tree trimmers in your area. For example, San Diego residents can obtain up to two cubic yards of mulch for free at Miramar Greenery with proof of residency. 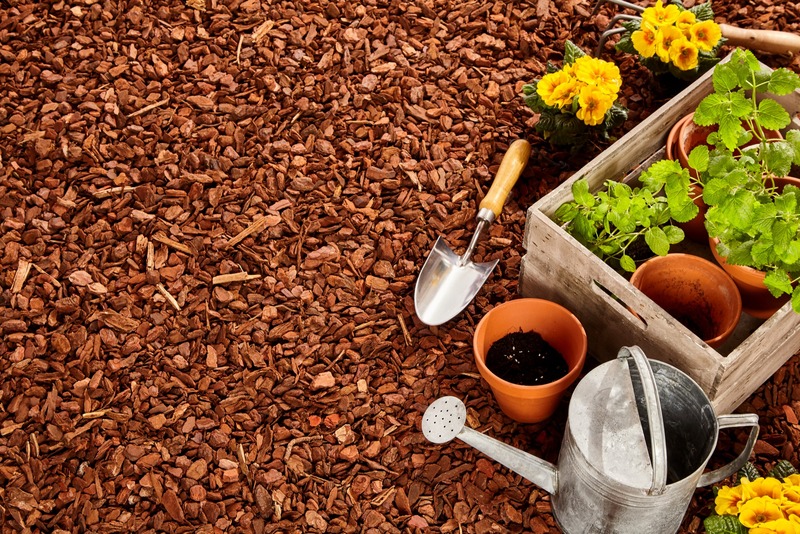 Rubber mulch made from recycled tires is available in a variety of colors and is an easy lawn alternative that can last many years with minimal maintenance. Shredded rubber mulch looks like organic mulch and functions in much the same way to limit weed growth and control erosion as a colorful ground cover. 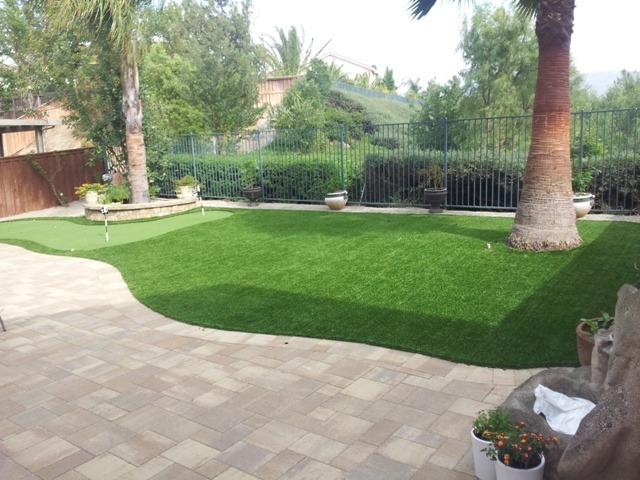 Synthetic turf is an ideal option for anyone who wants the look and feel of a natural grass lawn without the extreme water usage, chemicals and maintenance requirements. This low-maintenance option allows you to enjoy a lush lawn that you can use just as you would use a natural grass lawn, but without the frequent, ongoing water usage and high level of maintenance. Find out how much artificial grass will cost for your backyard with our fake turf calculator. Hardscape features of any type will take up space in your yard to allow you to avoid a grass lawn or limit its size. Patios, in particular, are a good option since they provide a high level of utility and can be used to entertain, relax at the end of the day or cook family meals on your grill or in your outdoor kitchen. This is also a good option for combining with an artificial grass lawn for an overall low-maintenance, functional backyard design that can be enjoyed throughout the year. Replacing a natural grass lawn with a wood or composite deck is an ideal way to increase your functional outdoor living space and lower your property’s irrigation needs. This option is particularly well suited for families who enjoy spending a lot of time outdoors or who entertain regularly. Adding a gazebo to your backyard is a great way to reduce lawn size and can also be included in an overall plan for a no-lawn backyard when used with ground covers, patios and flowerbeds. This attractive addition also provides a space for reading, relaxing, meditation or entertaining. If your natural grass lawn is functioning primarily as a play area, but you would like to remove it to save water and reduce the time you spend caring for your yard, installing a playground might be your best option. Once you remove your lawn and choose the play structures to install, you can use mulch or artificial grass as a ground cover beneath the play equipment. Adding a fire pit with a seating area is a great way to use space in your yard while adding an attractive, useful landscaping feature. A simple rock or paving stone fire pit can be surrounded by gravel, or a patio made from concrete or pavers, to provide a wonderful spot for entertaining guests or roasting marshmallows with your kids. Island flowerbeds are good choices for people who either want to reduce their lawn size or replace their grass completely. For reducing lawn size, this type of flowerbed allows you to remove as much or as little as you want of your natural grass lawn. That area can then be planted with low-water, low-maintenance plants that add texture and color to your yard. To replace your lawn completely, you can pair and island flowerbed with another of the options on this list, such as artificial grass, mulch or gravel. Rock gardens can be small areas with strategically placed boulders and rocks, or they can be the basis of your entire landscape design. By using a variety of rocks and gravels in various sizes, textures and colors, you can create a beautiful, inviting outdoor living area that requires little to no water or maintenance. If you are replacing your lawn to save money on your water bill and lower your home’s environmental impact, then you really cannot go wrong with xeriscaping. This type of low-water landscaping is popular in Southern California and can be seen throughout the Southwestern United States. The basic principle is to use drought-tolerant native plants and succulents to create a low-maintenance, low-water alternative to natural grass lawns and other water-wasting landscaping options. Replacing your natural grass lawn with a family orchard transforms your lawn area into a functional, food-producing space you can enjoy with your family for years to come. To limit weed growth and make it as low-maintenance as possible, install a drip system and cover the bare earth between trees with mulch, gravel, wood chips or bark. Lantana is incredibly easy to grow in Southern California, is drought-tolerant once established and grows quickly. 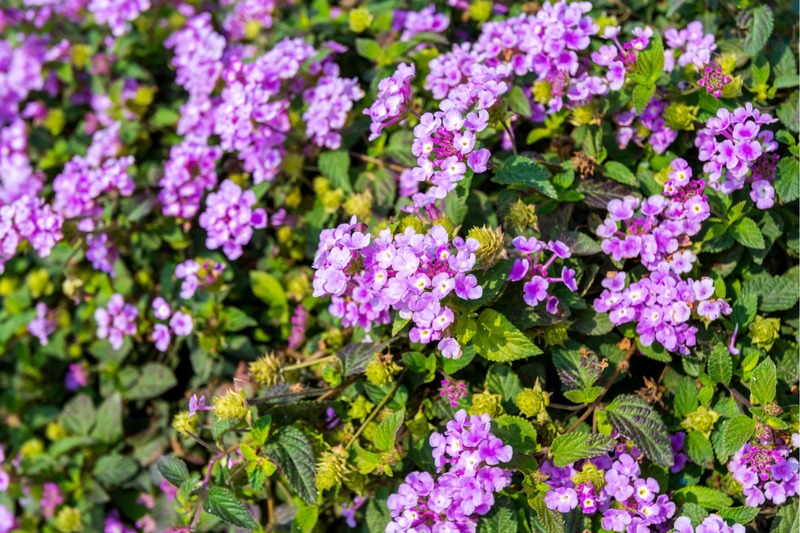 Make sure you choose a variety that is used for ground cover, because some can grow into sizable shrubs. Plants can be found with white, red, pink, blue, orange or yellow blooms, so you are sure to be able to find one that suits your needs. Clover is a great choice for people who want the look of a natural grass lawn, don’t mind a bit of mowing and are not concerned about a lot of traffic. This pretty ground cover requires little water and stays green all summer without the need for chemical fertilizers. It is an inexpensive option that looks great and can stand up to some traffic. Creeping ivy is a vigorous grower that will be more than happy to cover your entire lawn area for you. This easy-to-grow option will take root almost anywhere and can even be grown from cuttings or divisions acquired at no cost from a friend or neighbor. While it is beautiful to look at, it can be a bit monochromatic if not paired with other plants. Creeping thymes are low-maintenance ground cover plants that can even be harvested for culinary or medicinal purposes, depending on the variety you choose. It can be used in light traffic areas or around stepping stones, which allows its fragrance and tiny flowers to add character to walkways. Be sure you choose a variety of thyme that is appropriate for the size of the area you need to cover, since there are both slow- and fast-growing varieties. If you plan to harvest it for culinary or medicinal purposes, it is best to use this lawn alternative away from areas that are used for parking, walking or pet restroom areas. Oregano is another herb ground cover option that can be used to replace a natural grass lawn. This attractive choice brings a delightful fragrance to your yard and can handle light-to-moderate foot traffic, depending on the variety you choose. Creeping oregano is a fast grower that only gets about three inches tall, which makes it among the best choices of oregano varieties to use as living ground covers. 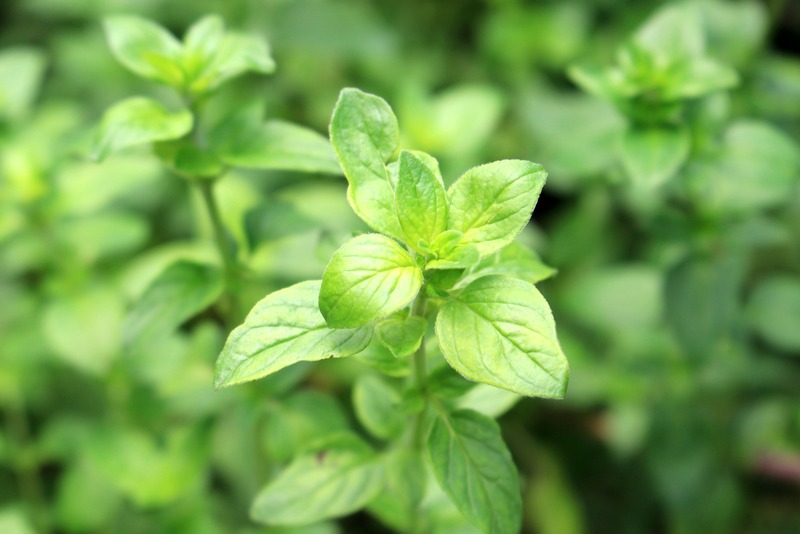 Remember, if you plan on using your oregano for culinary or medicinal purposes, it is best to use it to replace lawns that are not near areas used for parking, walking or pet restrooms. Alternatively, you can always plant a separate crop in a container or in your herb garden for household use. Prostrate rosemary (also called creeping rosemary and trailing rosemary) is an attractive, drought-tolerant option that is ideal for use on slopes and hillsides, particularly if you have a paving stone retaining wall that it can spill over. This type of rosemary has a good root system for controlling erosion and is perfect for replacing a natural grass lawn in a low-traffic area, like a hillside. While it can withstand traffic, it is too bushy to walk on, so this is best used in areas where it can show off its white or bluish-lavender blooms and give off its lovely fragrance without encumbering walking paths. This also keeps it away from children, pets and parking areas if you intend to harvest it for household use. If you have narrow strips of natural grass bordering walkways, you can replace the grass with rosemary hedges. This will enhance the visual appeal of your yard, add lovely color and fragrance, and allow you to enjoy drought-tolerant greenery along your garden paths. You can also replace a larger lawn area with a maze or labyrinth made from rosemary hedges. This whimsical addition will give your yard an old-world touch and take up plenty of space with an attractive, low-water, living grass lawn alternative. Low-growing shrubs, such as dwarf myrtle, can be drought-tolerant lawn alternatives that can be left to grow wild, or trimmed for a ground cover that is about one foot in height. Dwarf myrtle does fine in full sun and requires little water once established. It will also crowd out weeds once it fills in and has tiny, white blooms beginning in spring and lasting through summer. Low-growing shrubs are good for erosion control, so they can also be used as a lawn alternative on a slope. The silvery-green foliage of this drought-tolerant ground cover can seriously enhance the visual appeal of your lawn area. Fast growing and low to the ground, silver ponyfoot can thrive in part shade or full sun, which makes it a versatile option for Southern California gardens. It can be grown around stepping stones in a walkway or allowed to spread to fill in an entire lawn area. This one is not a thug, so you can also intersperse it with other low-water ground covers to replace grass. Moneywort is an invasive thug, which means that it will spread quickly and overtake pretty much anything in its path. Invasive thugs are usually not wanted in gardens, but it does make them a good choice for folks who have a large lawn area to replace. With proper edging and regular efforts to control the spread, moneywort can be an attractive grass alternative that will even grow in shade. Just keep in mind that this thug really will creep, so be aware of this before you plant it. Like Creeping Jenny, Creeping Charlie is an invasive, fast-spreading ground cover. However, unlike Creeping Jenny, Charlie is not a thug. So, while it will take over your lawn area and every flowerbed and border in sight, it actually can be used among other plants without killing them. Generally considered a weed, Creeping Charlie has soft, attractive leaves and is often grown as a salad ingredient when not being used as a ground cover. Most gardeners know that all varieties of mint are best planted in containers so that they do not take over the entire garden. However, this invasive quality is precisely what makes mint such a great lawn substitute. If you want an attractive, fragrant, grass-free lawn, mint might be the right choice for you. As an added bonus, you can harvest it for making tea, cooking or medicinal purposes. If you do plan to harvest it, be sure to only take cuttings that are not close to parking areas, pet restroom areas or walking paths. Some chamomile varieties can be used as lawn alternatives, such as English chamomile and Roman chamomile. While this grass replacement is fairly time consuming in the beginning, it becomes an attractive, low-maintenance option that can even withstand traffic once it is well established. 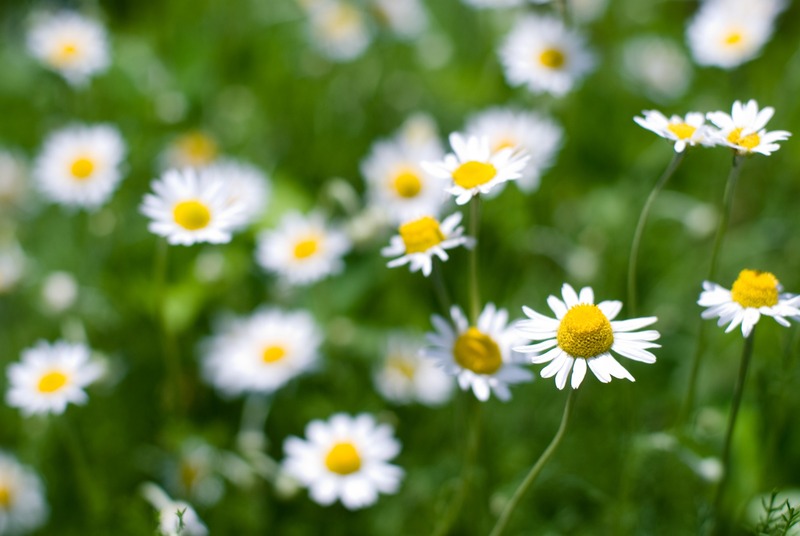 The small, white flowers on many creeping and low-growing varieties make chamomile lawns particularly appealing. Several varieties of yarrow can be used as a dense, traffic-tolerant lawn alternative. Dwarf yarrows are often the best choice for those who want something that looks and acts more like a traditional lawn. Flowering varieties are also a popular choice, since they add more color to your yard. While yarrow is not drought tolerant, it only requires about half of the water needed to keep a natural grass lawn healthy, so it is a water-saving lawn replacement. To create a lawn that can withstand a lot of traffic, mow your yarrow regularly for a denser ground cover. Drought-tolerant ornamental grasses are a good choice for folks who know they need to give up their conventional grass lawn for the sake of the environment, to save money and to save time on yard care tasks but who are not quite ready to completely give up grass. These attractive lawn alternatives require no mowing and little water once established, plus the clumping varieties will grow only where you plant them, so you do not have to worry about invasive spreading. The biggest downside is that most ornamental grasses are only for looks, so this lawn alternative will not work in areas where you actually want to use your lawn. Check out mondo grass for low-growing varieties if you are looking for a shorter grass that will look a bit more like a conventional lawn but without the regular mowing requirements. Lilyturf is an ornamental grass that is a popular lawn substitute but needs to be addressed separately, because its qualities differ from the ornamental grasses mentioned above. Creeping lilyturf, as the name implies, is a creeper, which means it send out runners and will continue to spread if not controlled. While it can withstand a little traffic, lilyturf makes for a pretty lumpy lawn, so it is not ideal for play areas or walkways. California meadow sedge is one of several sedge varieties that can grow well in Southern California. In terms of living lawn alternatives, sedges are among the fastest growing in popularity and, once you have seen just how conventional-grass-like some of these sedges can be, you will know why. While they do require regular irrigation, sedges require little to no mowing, thrive in a variety of soils, and can withstand foot traffic. For higher-traffic areas, California meadow sedge is a particularly good choice. Plus, this variety can grow well in the clay soils we see throughout San Diego, as well as the sandier soils near the coast. Ice plant is the type of plant folks either love or hate. It can be seen everywhere in coastal California, often taking over a large area, since it can be quite invasive. This invasive tendency can be a problem, but it also makes it an easy-to-grow choice as a grass alternative that will quickly cover your lawn area with greenery and seasonal blooms. The terms stonecrop and sedum refer to a large range of succulents that thrive in sunny spots and require little water once established. Creeping varieties are particularly good choices as grass alternatives and can be planted from clippings, which makes this an inexpensive option. This option is just for show and cannot be used in areas with traffic or where children or pets play. If you simply must have at least a small patch of natural grass, you can still save money and limit your environmental impact. You can do this by choosing drought-tolerant grasses, such as buffalo grass, zoysia or switchgrass, that require less water and by using a push mower, instead of a lawnmower powered by gas or electricity. Low-maintenance, drought-resistant grasses also require less weeding and fewer chemical lawn care products, making them a better choice than conventional lawns. You can also limit the space you dedicate to natural grass by including walkways, flowerbeds and plant borders in your landscape design. Limiting your lawn space, or replacing a grass lawn completely, can help you lower your water bill, save time on maintenance and limit the chemical products required to keep your yard looking great. With the alternatives listed above and a bit of creative landscaping design, you will find that you can have an inviting, visually appealing yard with little or no natural grass. Do you have a favorite grass alternative that you have used in your yard to reduce the use of water and chemicals? If so, we would love for you to share your landscaping tips in the comment section below.